A slice problem can make even the widest of fairways seem narrow and intimidating. The slice shot, in which the ball comes off of the club and travels briefly toward the target before veering sharply away from the golfer and often out of play, is the bane of many recreational golfers. It can be one of the more frustrating problems to work on. Fear of the slice even forces many players to abandon their driver on the course, lest they lose their balls off the tee. There are several potential fixes which can be tested on the range in an attempt to fix a slice. Draw a line on your ball, traveling down the seam. When on the tee, you can set up the ball with the line pointed straight towards your target, making it easier to check the alignment of your club head, feet, hips and shoulders. 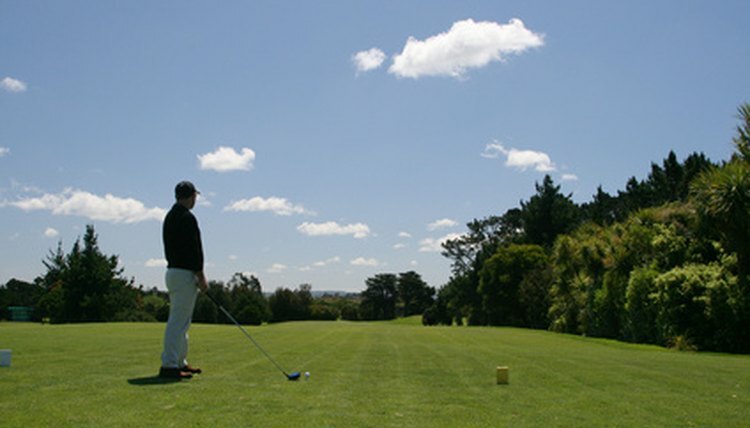 Practice making adjustments to your swing at the driving range until the slice is rectified. Working on changes at the range allows you to fix the shot without sacrificing a round's score, and also allows you to hit more shots for your money than on a course. Strengthen your grip by turning the hand that is situated lower on the club so that is oriented more towards the front of your stance. This will help you to turn the club over at impact, preventing you from hitting it with an open face. Stand more erect over the ball. This will help to reduce the likelihood of striking through the ball with too sharp an angle, which puts spin on the ball and leads to a slice. Close your stance by moving your front foot slightly toward the ball, and your rear foot slightly back. This will help to make clearing your hips at the point of impact easier. Move the ball forward in your stance, so that the point of impact gives the club more time to finish coming around so that it does not strike at a slicing angle. Turn the club in your hand slightly, so that the club head is actually facing towards you slightly before swinging. A slice can be caused by your hands turning the club while swinging, causing the face to be pointed away from you at the point of contact. By starting with the face slightly towards you, you will create a slight spin on the ball that will help correct its path. This is not a permanent fix, but it can be used as an emergency measure when a quick remedy is needed in the middle of a round, when you do not have the luxury of going to the range to fix your swing. How Do I Hit a Golf Ball Straight?